Came across this amazing cartoon this morning while browsing through a group I am in on Facebook. Yes, sometimes I am a social media junkie. But, most of my social media junkie moments are still focused in the EC world. Yes, I still need a life. But, back to the important part – this cartoon! What I love about this is that we can probably all relate to this. Many parents are wondering just how is play learning? And we are struggling on how to communicate it! 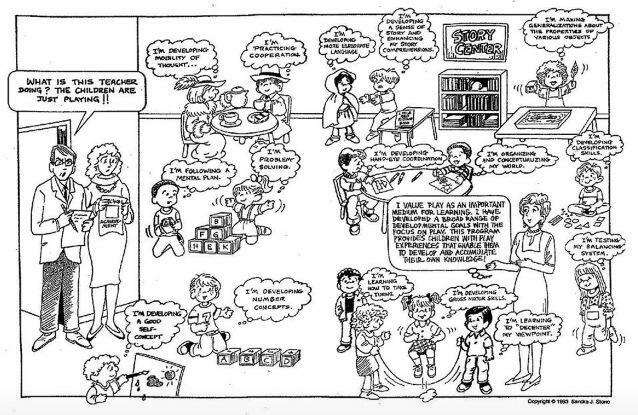 This cartoon breaks down just a few ways that learning and growth is happening during play. Now the fiery passionate advocate in me could continue to be flustered over this or I could step back and realize that knowing play is learning is not something that comes naturally to everyone – and really not to us either. If you are teaching through play, chances are that you have spent time studying play while obtaining a certificate or degree, reading books, attending conferences, and the many ways early childhood advocates refine their knowledge. So, why do we get baffled when a parent wants evidence? Many of us, I am sure, just want all of humanity to honor childhood for the joy and window of wonder it is. The push down of American education has greatly taken its toll on childhood and the preservation of play. The obsession with results has hindered the ability to nurture children with love and support as they grow into whole beings and not just brains filled with splinter skills. So as educators how do we battle the inevitable. The fact that society is pushing traditional skill driven education is not going to change over night. What can we do today to sell PLAY? I think the first step is to find tidbits like these cartoons to share with parents and community members. Small steps sometimes take us on far journeys. Each day as early childhood educators we fight for children and their right to play but sometimes we forget to create allies with small steps. Take a small step… share this cartoon or simple supportive bits of evidence of how play is learning. Maybe it is a photo with a caption, a brief article, a documentation sample… Take a moment to share the little pieces that sold you on PLAY, these little pieces might just be what changes the world for children, education, and you as an educator. Reggio by far has been one of my favorite progressive genres. I love that it serves as a model for reflecting the children and community into its methods. Respectful relationships, beautiful environments, and child centered practices are just a couple things that sell me on this genre of education. The above poem sums up a lot of what is crucial for every child on a daily basis. Children deserve to be heard and it is all to often that their needs and desires are neglected for an adult agenda. When is the last time you let a child share one of their hundred languages? When first becoming an Early Childhood professional, many years ago, I felt like my pile of resources and things to know reached the sky quick. I was reminded of this a couple weeks ago during in-service as we discussed how truly amazing educators all have truly amazing moments just as much as they have truly horrible moments – and the reason being is we are constantly tweaking our methods and practices. The unique platform of being progressive is not just that curriculum is structured (as it should be for children) as a top down practice and not bottom up but also that as educators “we have never fully arrived”. Progressive education means that our practices, environments, and beings are always evolving and changing. A difficult but miraculous feat! NOTE: An abridged version of this article was published in Parents magazine in May 2000 with the title “Hooked on Praise.” For a more detailed look at the issues discussed here — as well as a comprehensive list of citations to relevant research — please see the books Punished by Rewards and Unconditional Parenting. Manipulating children. Suppose you offer a verbal reward to reinforce the behavior of a two-year-old who eats without spilling, or a five-year-old who cleans up her art supplies. Who benefits from this? Is it possible that telling kids they’ve done a good job may have less to do with their emotional needs than with our convenience? Creating praise junkies. To be sure, not every use of praise is a calculated tactic to control children’s behavior. Sometimes we compliment kids just because we’re genuinely pleased by what they’ve done. Even then, however, it’s worth looking more closely. Rather than bolstering a child’s self-esteem, praise may increase kids’ dependence on us. The more we say, “I like the way you….” or “Good ______ing,” the more kids come to rely on our evaluations, our decisions about what’s good and bad, rather than learning to form their own judgments. It leads them to measure their worth in terms of what will lead us to smile and dole out some more approval. Stealing a child’s pleasure. Apart from the issue of dependence, a child deserves to take delight in her accomplishments, to feel pride in what she’s learned how to do. She also deserves to decide when to feel that way. Every time we say, “Good job!”, though, we’re telling a child how to feel. In a troubling study conducted by Joan Grusec at the University of Toronto, young children who were frequently praised for displays of generosity tended to be slightlyless generous on an everyday basis than other children were. Every time they had heard “Good sharing!” or “I’m so proud of you for helping,” they became a little less interested in sharing or helping. Those actions came to be seen not as something valuable in their own right but as something they had to do to get that reaction again from an adult. Generosity became a means to an end. Reducing achievement. As if it weren’t bad enough that “Good job!” can undermine independence, pleasure, and interest, it can also interfere with how good a job children actually do. Researchers keep finding that kids who are praised for doing well at a creative task tend to stumble at the next task – and they don’t do as well as children who weren’t praised to begin with. Copyright © 2001 by Alfie Kohn. This article may be downloaded, reproduced, and distributed without permission as long as each copy includes this notice along with citation information (i.e., name of the periodical in which it originally appeared, date of publication, and author’s name). Permission must be obtained in order to reprint this article in a published work or in order to offer it for sale in any form. Please write to the address indicated on the Contact page at www.alfiekohn.org.